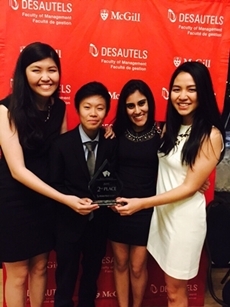 During 15th-21st March 2015, McGill Management International Case Competition (MMICC) was held in Montreal, Canada. Thammasat University is one of 11 participating teams in this competition. The team composed of Sirirat Tansaengwilai, Chavisa Ruangsiri, Sirada Sangthongsuk (BBA#20) and Raviphon Anadwal (BBA #22). In addition, Poonsak Sinthawat (BBA#20) also participated in international team that composed of members from finalist universities in previous years. 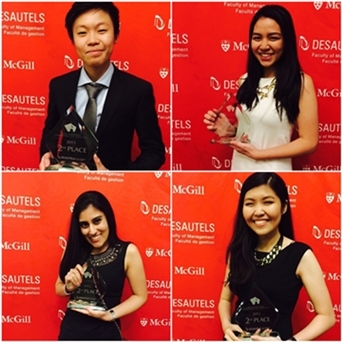 This competition, as usual, was divided into 2 parts; the social activities and the case competition. During the first 4 days, we have got a chance to travel around Montreal; Hike up on Mount Royal to see nice view of Montreal city, Experience snow activities by snow tubing, and try the traditional Canadian food with different type of maple syrups, etc. This is both enjoyable and knowledgeable to us. Not only about the activities, committees of this competition are the friendliest crew that makes everything even more fun. Therefore, the ice-breaking activities makes us not only know participants, but also get close to the committees. This competition, to me, is one of the best competition in both social aspect and the case. Thanks to our case team advisors, the faculty and Thammasat university that supported us and make this memorable experience happened. Posted date: April 16, 2015 � 11:20 Hrs.